The minerals of the Little Switzerland area have attracted interest since the first inhabitants came long ago. Indians have used local mica for ornamentation and gravesites for untold centuries. Though common here, mica is rare in many places and local Indians traded mica across many states. Discoveries of our local mica in the Hopewell Tribe mounds in Ohio show that this mineral has been mined here and traded for almost 2,000 years. One early explorer of this area was Hernando Desoto who is reputed to have come through here around 1540 looking for gold and silver. Some of the gold and silver he sought turned out to be mica. Near Little SwitzerIand is the ancient Horse Stomp Mine, so old that no knowledge or memories of it exist among the white settlers. Legend suggests that the Spanish worked the Horse Stomp Mine, but this has not been verified and little evidence is left. Mica again led prospectors to this area after the Civil War, and many fortunes were made from this peculiar mineral in the last 150 years. The Spruce Pine area has been one of the leading producers of mica since that time and mica is used in a variety of modern products including cosmetics, toothpaste, paint, drywall compound and many others. Emerald mining began in Little Switzerland around 1895 at the Crabtree Emerald Mine, later operated by Tiffany’s and the American Gem and Pearl Company. Today this abandoned mine still draws rock hounds from all over the world. hoping to find that elusive green flash of gem quality emerald. Other mines near Little Switzerland have produced aquamarine, beryl, garnet, smoky quartz and kyanite. Feldspar is another strategic mineral mined locally, and at one time the McKinney Mine near Little Switzerland was reportedly the largest Feldspar mine in the world. During the great depression of the 1930s mining was virtually the only industry in the area. 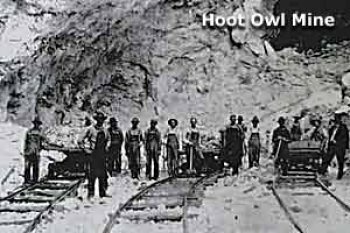 During that time it was not uncommon to find unemployed men waiting outside the McKinney Mines hoping to snag a “good” job earning 10 cents an hour for a grueling 10 hour day. “Pete” Deal was a mining engineer who also served as Postmaster for Little Switzerland for many years. He was instrumental in developing the mine at Emerald Village now known as the “Big Deal” Mine. The mines at Emerald Village are quite complex, and have produced over 54 types of minerals, including beryl, uranium minerals, and hyalite opal. In the last 50 years mining in the area has shifted from small scattered mines to large multi-national mining companies operating huge mines. Today, feldspar, quartz and mica are mined and used for an ever-growing variety of products and mining is still one of the largest employers in the area. Recreational mining and the tourism industry continue to grow in importance to the economy of this area. After 2,000 years our local minerals and gems still entice the imagination of a new generation of explorers. Alan Schabilion is a local realtor and business owner who resides in Little Switzerland.